Picture of Giovanni Bellini “Greek Madonna”. The size of the picture is 82 x 62 cm, wood, tempera. A special theme of Bellini’s art is his numerous “Madonna”, most of which is made in the artist’s studio and is signed only by his name, which often creates difficulties in attribution. 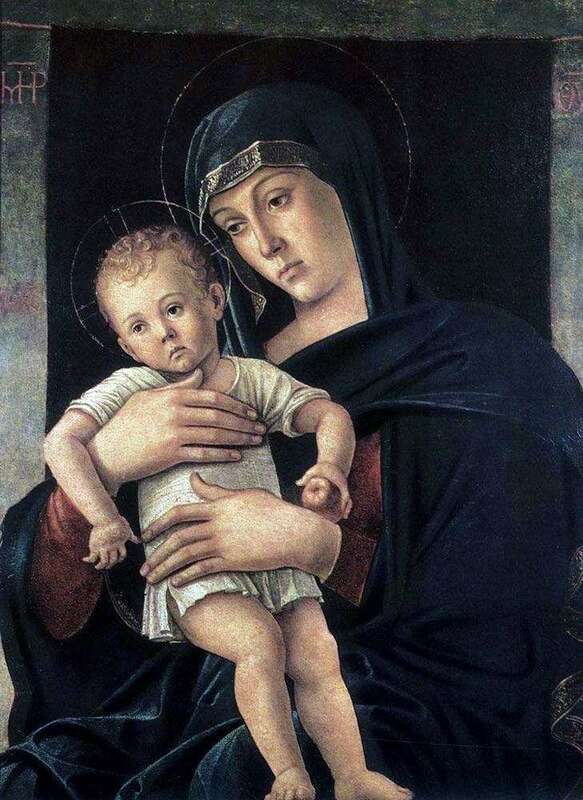 The early “Madonna” Bellini are close to the images of Mantegna, but gradually gaining classical clarity and simplicity, a feeling of enlightened thoughtfulness. Remotely reminiscent of the icon of an image of a mournfully pensive Maria, who tenderly embraced a sad infant, speaks of another tradition, from which the master repels, the traditions of medieval painting. However, the abstract spirituality of the linear rhythms and color chords of the icon is resolutely overcome here. Resistently strict in their expressiveness, color relationships are specific. The colors are true, a strong modeling of the volumes of the modeled form is very real. The subtlely clear sadness of the rhythms of the silhouette is indissolubly connected with the restrained vital expressiveness of the movements of the figures themselves, with the living human expression of Maria’s face. Not abstract spiritualism, but poetically spiritualized, deep human feeling is expressed in this simple and modest-looking composition. Description and meaning of the painting Greek Madonna by Giovanni Bellini.